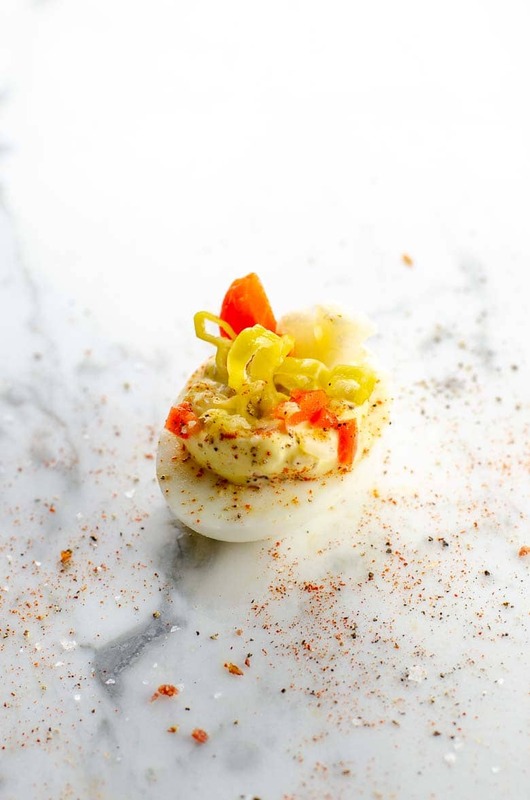 Giardiniera deviled eggs are among the easiest of deviled egg variations. They work equally well when you bring them to the buffet table fully dressed, or as part of a DIY deviled egg bar. Make them mild or spicy according to your preference. Giardiniera is an Italian pickled vegetable mixture that's often part of antipasto platters and salads. It typically contains cauliflower, red bell peppers, carrots, and celery and sometimes includes hot peppers. If you'd like to make your own giardiniera, try Domenica Marchetti's easy recipe. There's truly nothing complicated about this recipe. 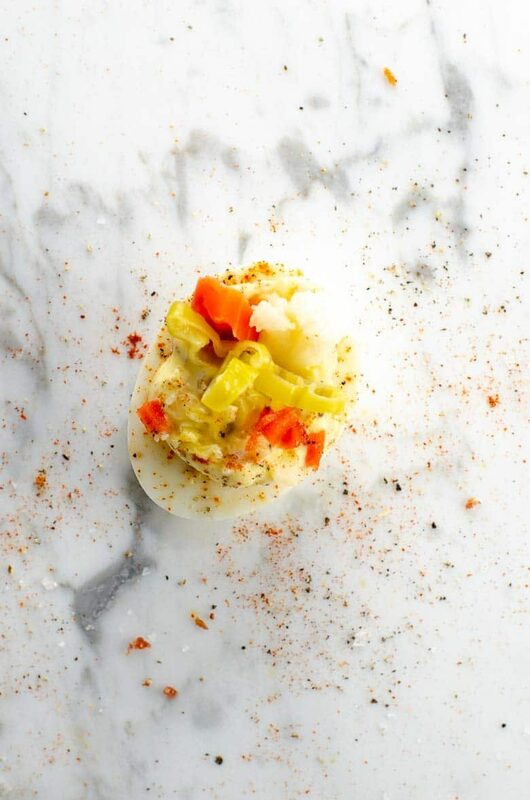 Once you've got deviled egg basics under your belt, it’s just a matter of finding a giardiniera that you like and rolling with it. We love the slightly spicy version that includes pickled peppers and have found several brands that we like when we don’t have the time or inclination to make our own. 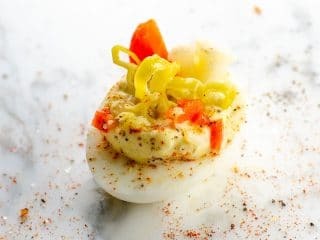 This deviled egg variation is a good one to bring to the buffet table fully dressed, but if you’d like to include it in a deviled egg bar, you can omit the minced giardiniera in the yolk mixture and simply place a bowl of bite-sized giardiniera pieces on the buffet for guests to top their own classic deviled eggs. This delicious take on deviled eggs could not be easier to put together. Begin with perfect hard-boiled eggs (and homemade mayo if you like, though to be honest I rarely do these days!) and this anytime buffet star will be ready in no time. Chop any large pieces of vegetables in the giardiniera into bite-sized pieces. Then take about 1/4 of the giardiniera and mince it finely. Add mayonnaise, mustard, salt, and pepper and continue mashing and blending with the fork until yolk mixture is creamy. Stir in shallot and finely minced giardiniera. Garnish each egg with a generous spoonful of additional giardiniera and serve.